One of my favorite places to ride my racebike is the cycle route up to the fishing village of Marken. This route is the best way to spend a summer day and it is also a popular route amongst locals and tourists. You can cycle along the picturesque dyke houses all the way through Durgerdam, a village just a few kilometers away from home. When crossing Durgerdam, I stumbled upon this image that made me smile. It is so rare to see clothes hanging in the city! I don’t know why, but it reminds me that life can be very simple. Oh I am so jealous of your route! 🙂 The photo is lovely. Did you want to kill me, with this photo? Amazing B&W and awesome scene! I’d never do that! Are you crazy? How could I live without you here supporting and encouraging my ramblings and photos? You’re too kind and generous. Thanks. I just wanted to express my appreciation for your photos and stories! Really love your blog and won’t miss any posts…. Looks like a wonderful bike route! Amazing photo! It is Terri. A very nice 45 km ride along the water seeing farmland and villages. Thank you. Fantastic photo, Lucile. It has made me smile too at it’s loveliness, and to think of simpler times. Thank you for such a lovely comment, Angeline. I really enjoy your blog and would like to nominate you to take part in the Free Style Writing Challenge I just participated in. If so, let me know and I’ll send you the link. If not, I understand and will look forward to your future posts and beautiful photography. I adore Amsterdam. Thank you for your consideration and lovely comment. And also for the invitation. I’d love to! Since the course ended I haven’t written anymore! Thank you so much for the appreciation! I love your blog too!! Lucile, this image has universal appeal and the bonus of stories that can be realized by the accompanying background. What a marvelous discovery on your bike ride. The conversion to monochrome gives the scene another layer of punch. The silhouette of clothes against the boldly bright sky also is a treat. Happy Photo Challenge. Sally, thank you for a very insightful comment. I always learn so much from you. A wonderful picture Lucile. There is nothing like clothes drying on the line, in fact our line is full now. There was a law passed in my 20’s that made it illegal to use a clothesline in the cities near where I live. It was reverted about 3 years ago, which is wonderful news. Such a savings in energy, and I love the sight of clothes blowing in the breeze! Thank you Carl! I’m so happy to learn that this image evoked such nice feelings not only on me. Still I’m surprised to hear about the existence of such law. It’s indeed energy saving. I can understand that to hang clothes from an apartment building is not ideal but from houses? Thanks for your lovely comment, Carl. It’s indeed very strange, Janet. I guess it’s state law, isn’t it? How bizarre. If they had such laws in Italy, there wouldn’t be enough prisons in the country! I’m happy you liked the photo. The route is indeed lovely. I posted more photos in color last year of the same route in a very sunny day. This specific photo in color is gorgeous too. I think it’s usual a local law, by city rather than by state. But either way, it’s ridiculous. Yes, it is. Carl from Canada mentioned that they had the same law until 3 years ago. Fabulous photo Lucile. The clothes are silhouetted and the sky is amazing. Love it. Thanks Desley! Next time you go there too! Hi Lucile, I think it is a great photo and perfect for black and white photography, reminding us of life as it was years ago. 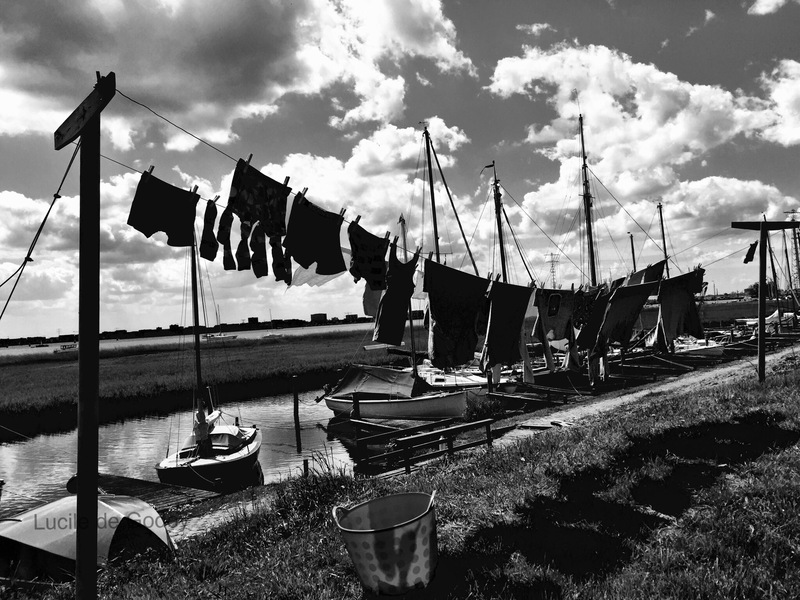 ( Although I still prefer clothes drying in the sun, as opposed the the dryer, but then this is easy in Australia) And this was in Marken! I travelled through there on my way to Hindeloopen by train about ten years ago and I met a gentlemen from Australia, travelling back to his home town, of Marken. Oh the stories he told me, it was fantastic. Thanks for the trip down memory lane. It is a very special part of the world, to which I hope one day to return. How interesting and what a coincidence that you’ve been visiting the area. It’s indeed a very special area of the country that looks like time has stopped more than 100 years ago! If you ever return, let me know. Yes, I love that old world feel. I’ll remember to let you know if I am heading that way. Please do, it’ll be a pleasure to meet you. Thank you. And likewise a pleasure for me to meet the woman behind your camera!! Lucile, this photo you took is a timeless one! I could be the present day or else 100 years ago! What a spectacular place to ride your bike! I agree that freshly-washed laundry hanging on a line takes on the most amazing scent of the outdoors…something a laundromat can’t provide! It is true, Lia, it’s timeless. I could have it in sepia and it would show that quality. This route is bucolic and the only but…is to be impossible to follow it during summer because of the tourists! Riding a race bike among city bikers who stop to make photos in the middle of the path, is a no go! So I’m enjoying it now while the peace lasts! Cheers and thanks for appreciating it with me. I think it counts too. Lol lets ask the city council!